Cryotherapy or cold therapy is a procedure used mostly by athletes to treat different kinds of conditions like muscle inflammations, ligament pain, swelling, and both malignant and benign lesions. The aim of this treatment is to promote healing. In cryotherapy, either the entire body or a part of the body is encouraged to heal when exposed to extremely low temperatures within a few minutes. This treatment works by reducing the cell metabolism to increase the survival of the cells, which decreases inflammation, spasm, and pain. In the end, it encourages vasoconstriction. For this treatment, two bags of cold ice are applied, where a pack that contains water is placed inside a pack that has ammonium nitrate. When the pack is squeezed, it breaks the inner pack causing the ammonium nitrate to dissolve in the water. The result is heat absorption that causes lower body temperatures to be achieved very quickly. Instant ice parks cause frostbites if they are refrigerated before use. Inside the latest ice packs, ammonium nitrate is not used for safety reasons. If a specific part of your body is injured, you can use an ice pack over the region to alleviate the pain and reduce the soreness of the muscles. Sports medicine often use this treatment right after a vigorous activity. However, it is important to reduce the length of time of its application because it can decrease an athletes performance if the ice pack is placed for more than 20 minutes. Always use an ice pack for less than 10 minutes. Whole Body Cryotherapy is one of the recent cryotherapy treatments in use today. In whole body cryotherapy, a patient is placed in a cryogenic chamber for approximately 3 minutes. To use the chamber, you have to wear a bathing suit, gloves, socks, and both ear and mouth protective equipment. This type of treatment works by stimulating the body to secrete the natural painkillers known as endorphins to provide relief from insomnia, joint pain, psoriasis, rheumatism, itching, and fibromyalgia. Cryotherapy appliances referred to as Crosaunas are used in partial body cryotherapy. When a patient steps inside the cylindrical chambers, the head sticks outside while the rest of the body is subjected to the cold environment. 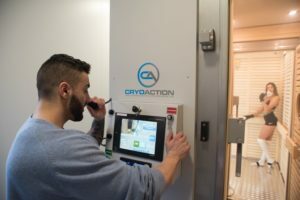 When a surgeon wants to treat a specific body organ inside the body using cryotherapy, freezing agents are used to make the treatment possible. One of the most common diseases that use this type of treatment is cancer. At CryoAction, we provide all the different kinds of cryotherapy. To safely undertake the right cryotherapy procedure for your injury, calls us now at 0800 014 8058.